all my shopping and searching online finally paid off- I am the proud new owner of my very own antique Persian rug!! I know, I know there isn't much red in it like my inspiration photos. But, I realized that I don't have that much red in my house and I am more drawn to the blues and other colors in the rug. Plus the size was PERFECT for my kitchen and it looks like it was made for the space. Don't you love when things happen like that? can't wait to see more of the kitchen! These are the kind of colours I would pick! Love it. Gorgeous! Where did you score this delightful rug? Ashley, thank you for the reminder- I totally forgot to put that in the post! I got the rug at esalerugs.com- love that place!! Those colors are beautiful together!! 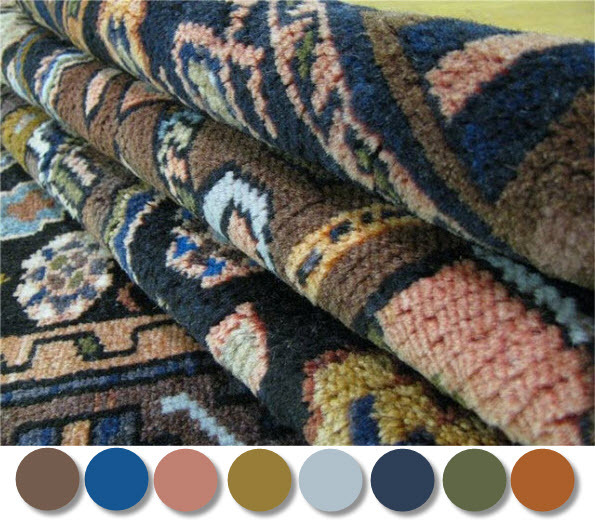 I've been looking for a rug with those colors for so long! It looks gorgeous. Nice find! These colors happen to make up a perfect fall palette! Definitely share pictures when you get it settled. I love the color combo! Dying to see it in all its glory.